Tired of looking at your blank and boring walls? No worries! 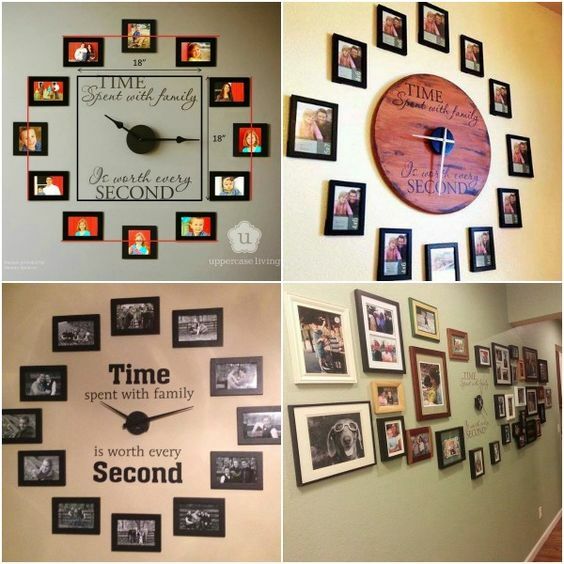 This post is surely going to help you convert your boring walls into a museum-worthy arrangement with the newest ways to hang your precious Kodak moments on the walls. Yes! You guessed it right, we are talking about photo wall hangings. There are so many creative and easy-to-do ways to make beautiful photo wall hangings to make your home look adorable. You don’t even need to spend big bucks on this home décor ideas because these photo wall hangings are completely budget friendly. You can easily customize these or go for a quick DIY. To make your work a little less, we have come up with some of the cutest and coolest ideas to make photo wall hangings. 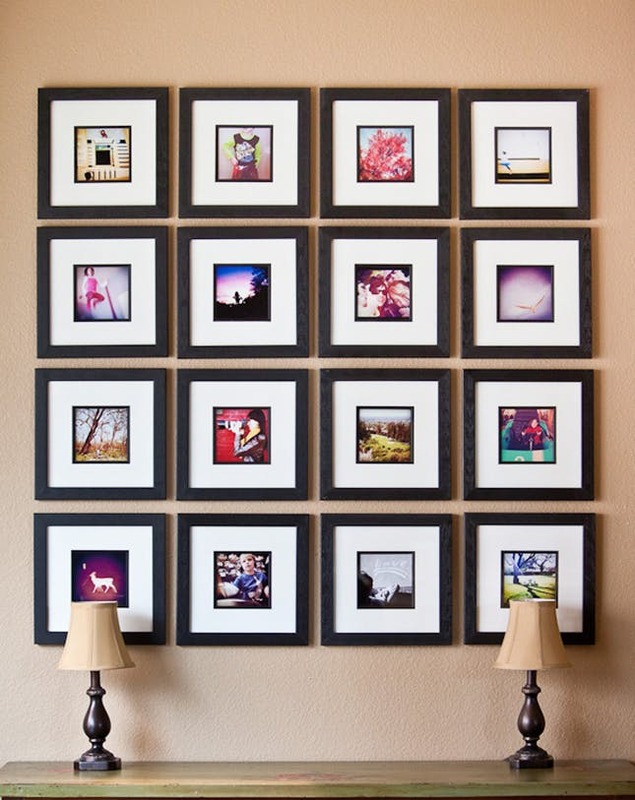 Here are some of the ways to hang your pictures you might not have thought of! Don’t forget to thank us later. 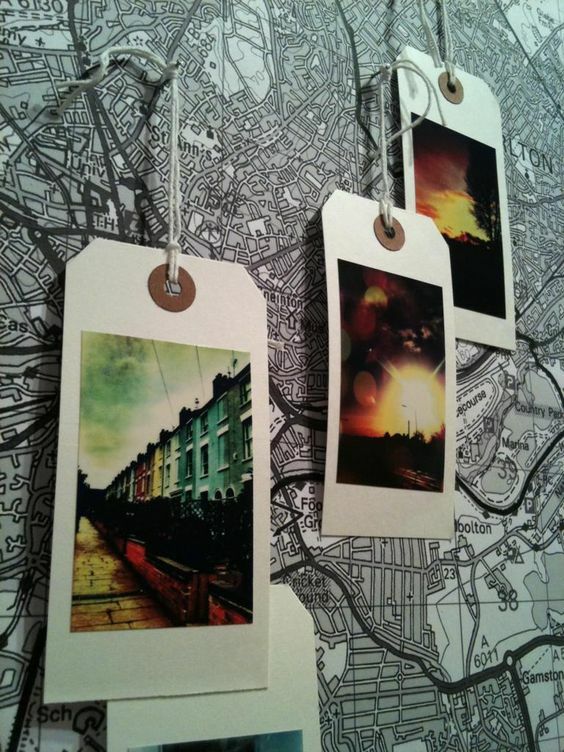 Not always you need frames to hang photos on your walls, just make photo tags out if your favorite vacation pictures. Photo tags are the easiest way to use your photos which are just lying in your computers or phones. All you need to do is print some beautiful pictures, make a hole so that a thread can pass out of it, and then hang the thread carrying your photo tag on a wall with the help of a nail. 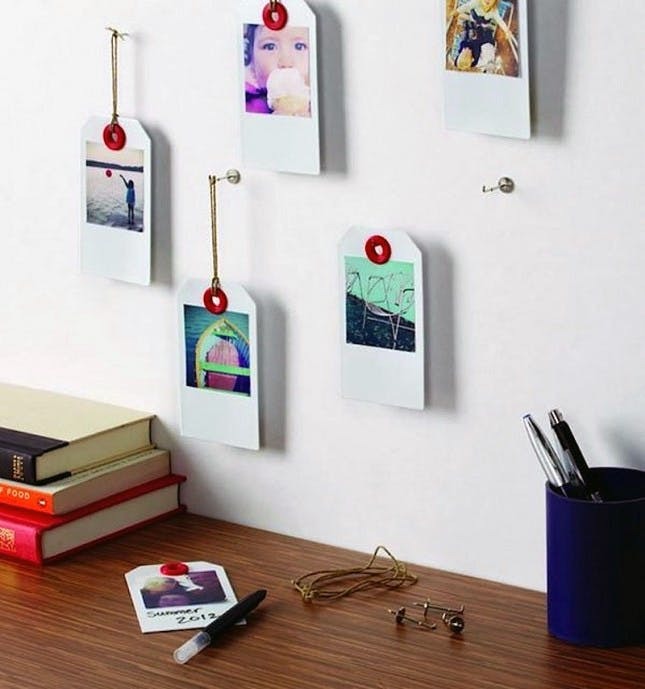 There you go, your cute little photo tag hangings are ready to rock the walls of your room. Just like you hang your clothes on a wire to dry, hang your photos by making a photo clothesline for visitors to see. 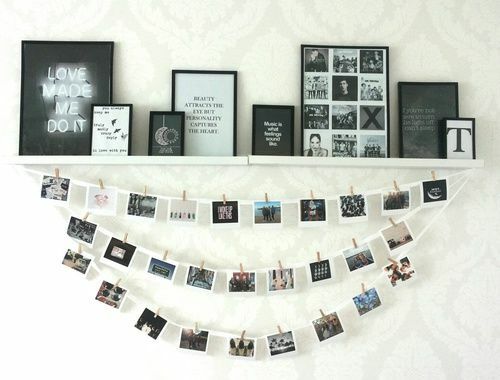 This again is a wonderful idea to showcase your favorite pictures by decorating them on your walls making a clothesline. A clothesline can easily be made by attaching pictures on a ribbon or wire using small clippers. 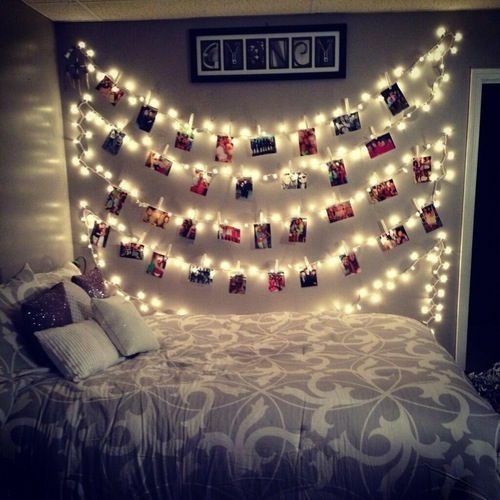 After you put the clothesline ribbon on the wall of your room, you can further decorate it with tiny light bulbs to make it look prettier in the dark. Now, this is something very interesting to transform an ordinary looking chandelier which is not very pleasant for the sight into something very stylish. The same old chandelier can be converted into your room’s showstopper piece by covering it with beautiful pictures of you, your family and your friends.You can also add letters and messages from your loved ones along with the pictures to give a stylish makeover to the chandelier and converting it into an incredible photo hanging piece. Making an Instagram style wall art with your favorite picture is the most decent way to display your photos on your walls. Use white background in the photo frames to make the concept look more impactful. But there is no hard and fast rule for doing it this way, you can always play and experiment with your creative ideas. 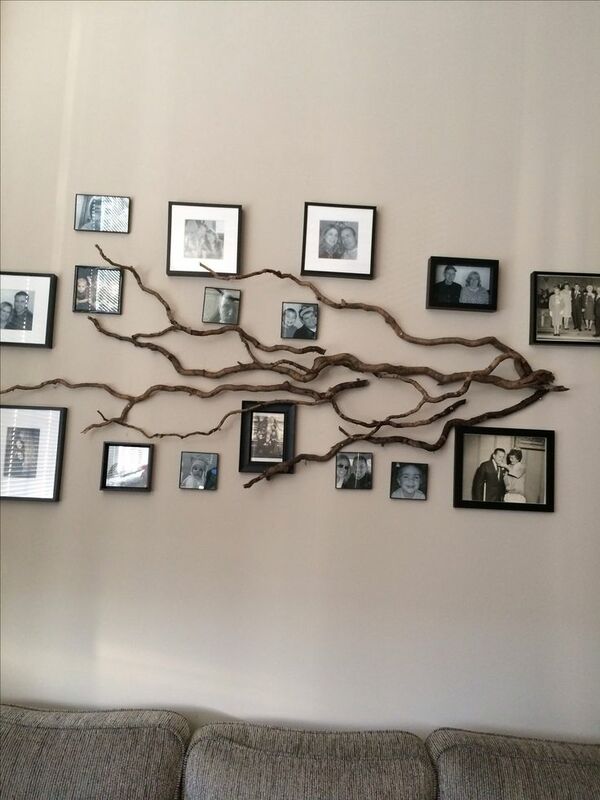 This photo wall hanging concept looks simple yet elegant. 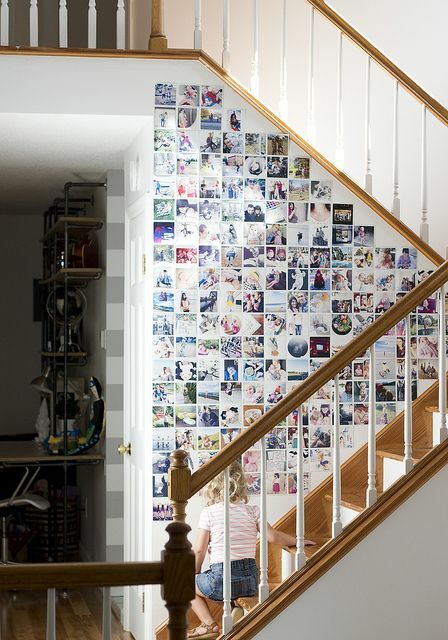 Just like your Instagram wall, this photo wall will get you so many likes from your family and friends. 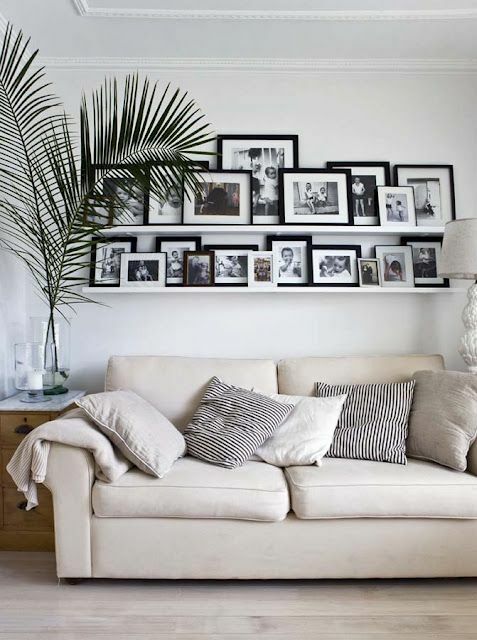 The idea includes not exactly hanging photos but placing your framed photos over wooden shelves attached on your walls. They work best for the living rooms but you can still find new places for them. These shelves are very much similar to the shelves we use in our rooms to place our books. 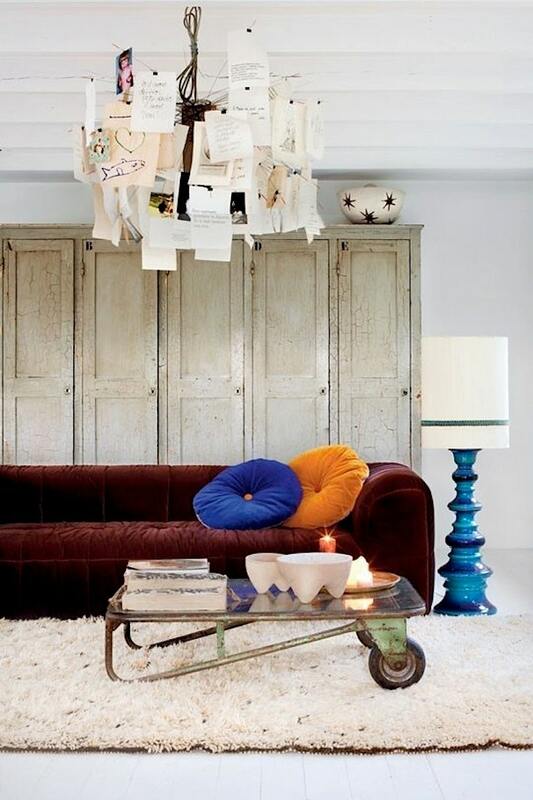 Place your photos on the shelves carefully in a creative way and make a beautiful wall art for your home sweet home. 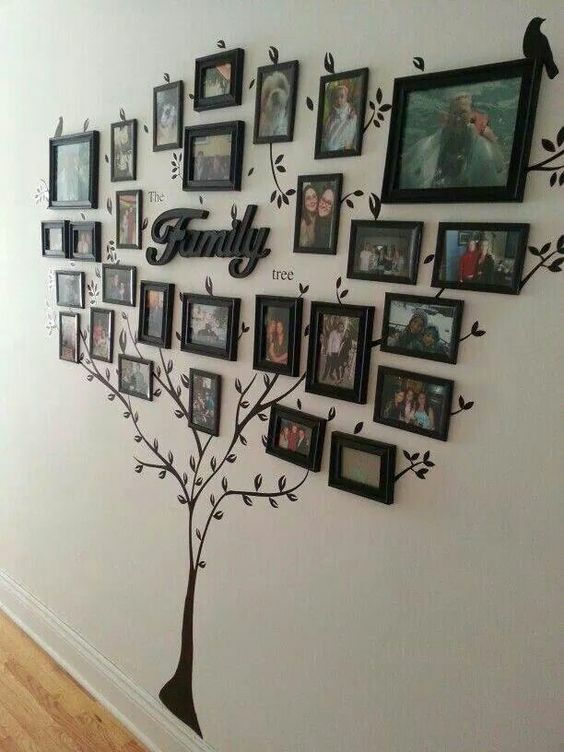 Create an eye-catchy family tree with your memorable family photos. If you don’t like the idea of making a very big tree that covers almost an entire wall then go for the small branches which look relatively small then the giant family tree. Place it to the wall where it can easily be seen by visitors. You can customize it according to your room dimensions. Make sure it doesn’t look too big or too small for your walls. Photo Wall Collage is an unusual and eye catchy way of documenting your lifetime memories. With this, you can create a treasured keepsake that you will be proud to display. Gift your staircase wall this photo art so that it can build a story out of it. Place the photos in a neat and clean way not making it look confusing to others. 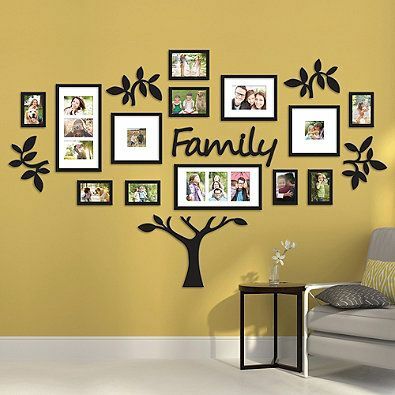 Family photo wall art is a great idea for your home décor using your unforgettable memories. Whatever time you spent with your family is worth every second! 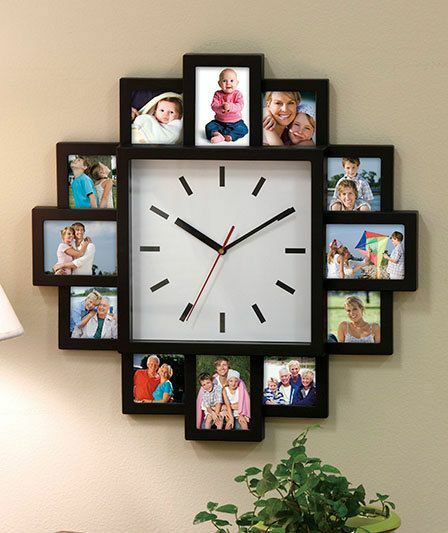 That is the only reason we have come up with the idea of making a wall clock with your favorite family photos to remember the good old times that you have spent with your family. Every time you look at this photo wall clock, you will miss those times a little more. Corners are usually ignored when we try to decorate the walls of our rooms. 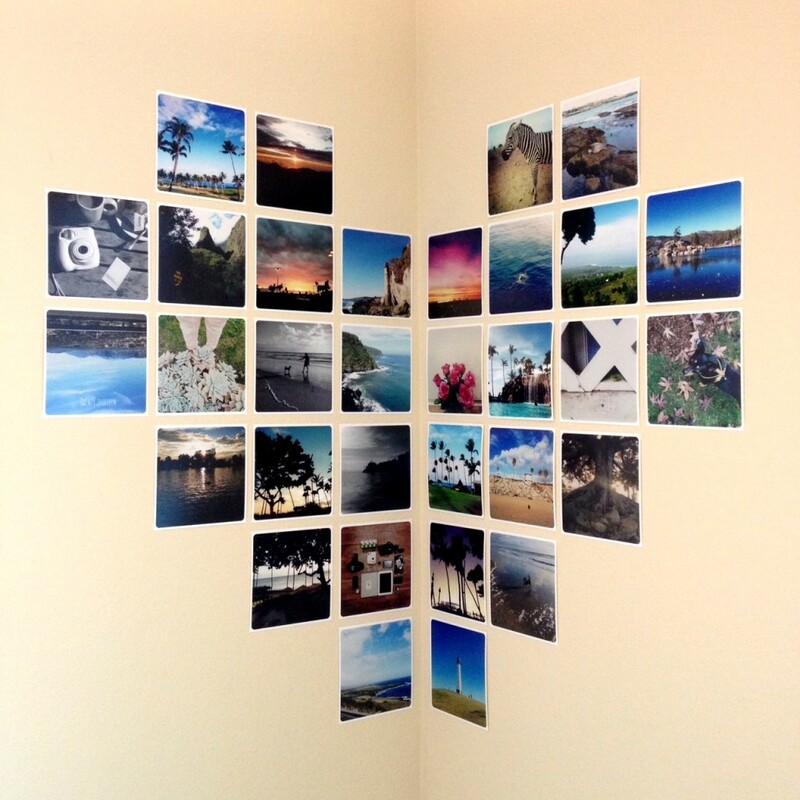 This photo heart display wall art will definitely add some life to the corners of your room. If you are bored of hanging photos the usual way then you should give this corner art a try. You can try experimenting with different shapes as well but this heart shapes looks the best. 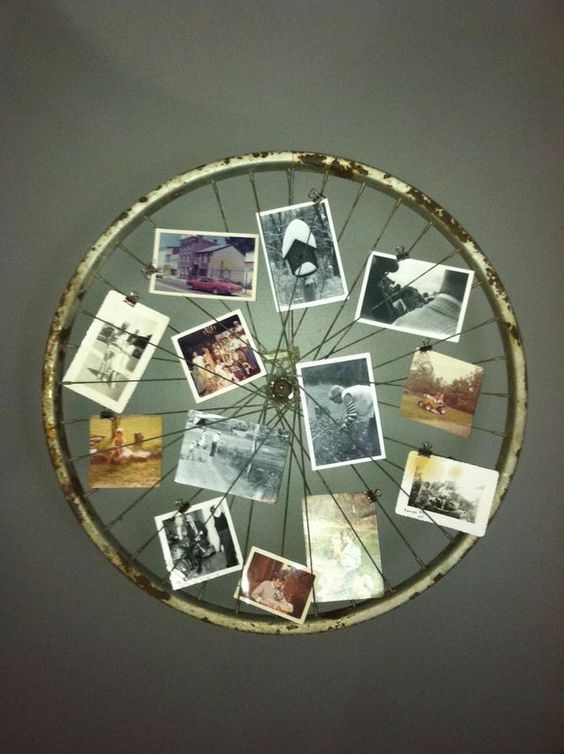 Use an old bicycle wheel to display your photos in a fun way. If you don’t have a bicycle wheel then you need to visit your local bike shop and ask for their cast-off bike wheels to create these amazing bicycle wheel crafts. 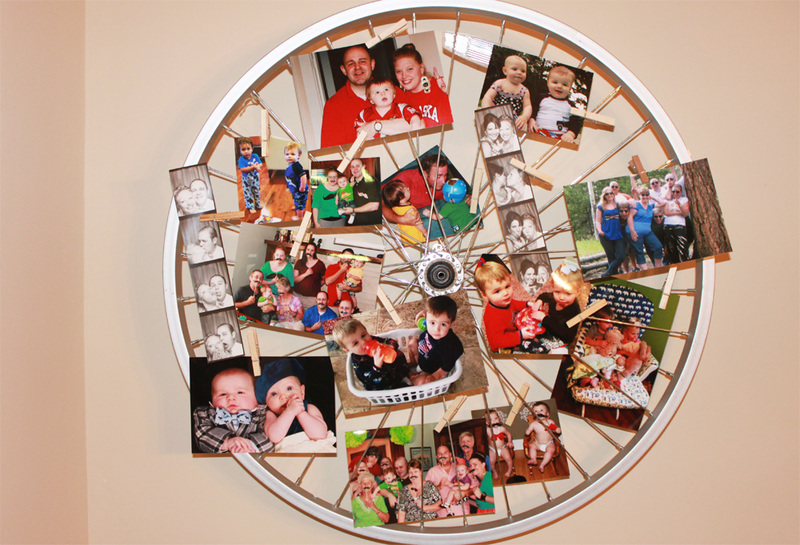 Put your favorite pictures on the spokes of bicycle with the help of clothespins or tiny clippers. The beautiful bicycle wheel having your wonderful memories is ready to rock your wall.